The far-reaching view to the southwest from the Shell Keep of Lewes Castle. 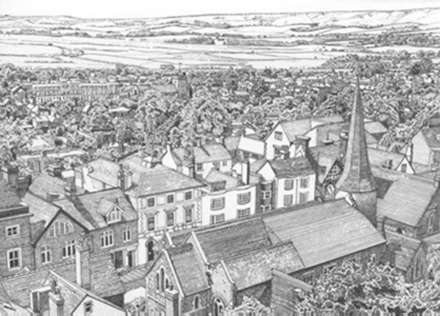 Included in the drawing are the High Street, Priory Crescent, Southover Church and the South Downs beyond. Pen and ink drawing by Marietta Van Dyck © 2000.